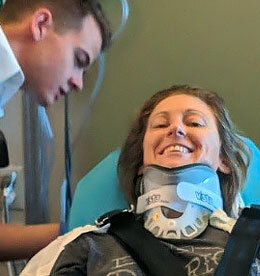 Jockey Nikeela Black Abrams was transferred to Craig Hospital in Denver on Wednesday where she will begin rehab following a riding accident on September 2. DENVER, CO—SEPTEMBER 13, 2018—Leading Idaho-based jockey Nikeela Black, who was injured in a riding accident September 2nd at the Eastern Idaho State Fair in Blackfoot, was transferred from a Salt Lake City hospital yesterday to Craig Hospital in Denver where she will begin rehab. "This feels like my first day of school, I don't really know what to expect yet and there are a lot of tests," Black said in a post earlier today. "I enjoyed meeting with my doctor yesterday and her team and have complete confidence in her ability to guide me through the next phase of my recovery. There has already been talk of adaptive saddles and getting me back on a horse." A jockey for nearly 15 years, Black gained notoriety as a leading rider at many race tracks. Black suffered a partially collapsed lung, fractures in her neck and is paralyzed from her ribs down in the spill. She is also an attorney in Boise. Originally a native of Kennewick, Washington, Black has ridden 224 Quarter Horse winners with earnings in excess of $1.1. million and 429 Thoroughbred winners of $1.3 million. She won the 2011 Grade 2 Bitterroot Futurity at Les Bois Park aboard Illtacmanhattan for trainer Monty Arrossa. A GoFund Me account was established following the accident to help with her recovery expenses. "I wanted to thank you all again for your support and to let you know that some of the donations were you used to purchase supplies for my time here at Craig," she said today. "I felt completely spoiled and it removed some stress from my life. Please send thoughts of strength and perseverance as I begin my therapy, (eight hours a day). I cannot thank you all enough. I am blessed." Person's wanting to help in Nikeela's recovery can click here CLICK HERE.